Distracted Driving Awareness Month is observed each April to bring national attention to the hazards of distracted driving. The dangers of distracted driving are serious and the results can be severe. The National Highway Traffic Safety Administration reports that in 2016, distracted drivers caused 3,450 fatalities and 391,000 injuries on America’s roads and highways. That’s at least 9 people killed and 1,000 injured every day. Washington State Traffic Safety Council data shows that distracted driving causes 30% of fatalities and 23% of serious injuries in crashes in the State of Washington. Operating a motor vehicle requires full attention to the road, but it’s easy to become distracted when you are driving and at the same time using a mobile device, changing radio channels, using a calculator, applying cosmetics, smoking, eating or drinking. Looking at billboards, buildings and people also causes major distractions. Texting is among the most dangerous distractions. Typing or reading a text message takes your eyes off the road for at least 5 seconds. At 55 mph, that’s like driving the entire 120-yard length of a football field with your eyes shut. Driving while texting also increases your crash risk like driving with a blood alcohol content of 1.9. In 2017, Washington State passed a distracted driving law into the rules of the road. Getting ticketed for distracted driving is expensive. Fines start at $136 and can go up to $234 on repeat offenses. The citations stay on your driving record and increase your vehicle insurance rates. Federal law also prohibits texting by interstate truck drivers and forbids companies from requiring their drivers to text while behind the wheel. In addition to disqualification, civil penalties for truck drivers can reach up to $2,750 for multiple offenses, and $11,000 for companies requiring or allowing drivers to text while driving. Over 150 law enforcement agencies across Washington State participate in the Distracted Driving Awareness Month prevention effort. The best strategy to prevent a roadway incident is an easy one. Never take your mind off driving and always keep your eyes on the road and both hands on the steering wheel. Put away your cell phones and other handheld gadgets and objects until you are safely parked out of the flow of traffic. Trucking companies should implement a cell phone policy in their safety program that prohibits drivers from using their cell phones while driving. Drivers also should not handle dispatching devices, maps, or food while driving. …Read the rest of the news release here. The Department of Labor & Industries (L&I) has released the final version of the tips, gratuities, and service charges policy. You can find it on the Workplace Rights/Employment Standards Administrative Policies webpage. This policy includes updates based on feedback received on two draft versions last fall. I-1433 created new requirements in the Washington Minimum Wage Act (RCW 49.46.020(3)) for employers to pay tips, gratuities, and service charges to their employees. During the rulemaking process for I-1433, L&I committed to developing administrative policies like this one and providing opportunities for input. These policies are intended to help employers understand how to interpret and apply the law. The final policy language defines tips, tip pools and service charges and outlines requirements for payment to workers. The policy also adds the requirement that facilities that add a mandatory tip or service charge disclose to their customers the amount of the charge that will be shared with the worker, if any. This information must be presented in a restaurant menu and/or on an invoice or receipt. A service charge of ___% / $___ will be added to your bill. ___% of this service charge is paid to the employee or employees who served you today. A service charge of ___% / $___ will be added to your bill. 100% of this service charge is retained by [Business Name]. A mandatory gratuity of ___% / $___ will be added to your bill for parties of ___ or more. ___% of this service charge is paid to the employee or employees who served you today. A mandatory gratuity of ___% / $___ will be added to your bill. 100% of this mandatory gratuity is retained by [Business Name]. As part of the Alaskan Way Viaduct Removal Program, the Battery Street Tunnel will be decommisioned and filled to effect the permanent closure of the tunnel. With the Alaskan Way Viaduct closed, SR 99 no longer runs through the Battery Street Tunnel. Like the viaduct, the tunnel was built in the 1950s and is seismically vulnerable. Any new or continued use of the tunnel would require prohibitively expensive renovations. Closing the Battery Street Tunnel also allows WSDOT to rebuild the three-block stretch of Aurora Avenue at the tunnel’s north end, improving east-west mobility in that neighborhood. Contractor Kiewit Infrastructure West Co., began demolishing the Alaskan Way Viaduct on Feb. 15. Over the course of approximately six months, they will use large machinery to crunch, munch and cut the structure into pieces to be hauled away by truck. When the viaduct is gone, the City of Seattle will begin work on a new surface street and public open space along the waterfront. The tunnel will be filled in two phases, with material brought into the tunnel both from its south entrance and through grates along Battery Street above. Crews will partially fill the tunnel with viaduct removal rubble and then will pump in low-density cellular concrete from above to complete the fill. One way to beat the snowy cold weather is to dream of balmy days on the waterfront. 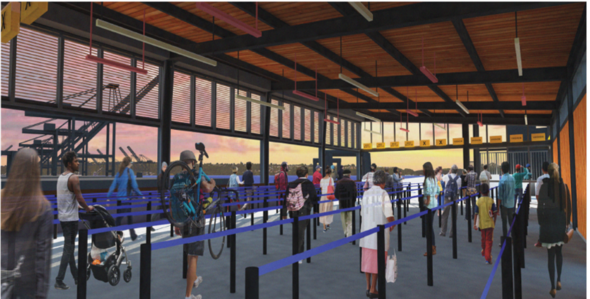 Here’s a look ahead at mid-2019 when the project will reach some major milestones, like opening a portion of the new terminal building and the new passenger-only ferry facility! There’s still a lot of work to go on this complex project that will be complete in early 2023. While there continues to be changes throughout the project, full ferry service will be maintained during construction. 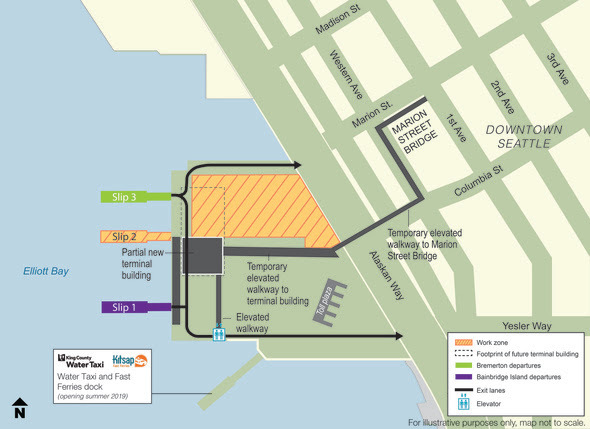 Starting in early summer, the new passenger-only ferry facility will open at the south side of the dock, complete with a new weather-protected queueing area. The King County Water Taxi and Kitsap Transit Fast Ferry will run their service out of this new facility. Later on in the sunshine season, the ferry service will move into part of the new terminal building and demolish the existing building. Temporary elevated walkways will connect the Marion Street Bridge to the new building.